The IRA later used social media accounts and interest groups to sow discord in the U.S. political system through what it termed “information warfare.” The campaign evolved from a generalized program designed in 2014 and 2015 to undermine the U.S. electoral system, to a targeted operation that by early 2016 favored candidate Trump and disparaged candidate Clinton. The IRA’s operation also included the purchase of political advertisements on social media in the names of U.S. persons and entities, as well as the staging of political rallies inside the United States. To organize those rallies, IRA employees posed as U.S. grassroots entities and persons and made contact with Trump supporters and Trump Campaign officials in the United States. The investigation did not identify evidence that any U.S. persons conspired or coordinated with the IRA. Section II of this report details the Office’s investigation of the Russian social media campaign. In March 2016, the GRU began hacking the email accounts of Clinton Campaign volunteers and employees, including campaign chairman John Podesta. In April 2016, the GRU hacked into the computer networks of the Democratic Congressional Campaign Committee (DCCC) and the Democratic National Committee (DNC). The GRU stole hundreds of thousands of documents from the compromised email accounts and networks. Around the time that the DNC announced in mid-June 2016 the Russian government’s role in hacking its network, the GRU began disseminating stolen materials through the fictitious online personas “DCLeaks” and “Guccifer 2.0.” The GRU later released additional materials through the organization WikiLeaks. The presidential campaign of Donald J. Trump (“Trump Campaign” or “Campaign”) showed interest in WikiLeaks’s releases of documents and welcomed their potential to damage candidate Clinton. Beginning in June 2016, [Redacted: Harm to Ongoing Matter] forecast to senior Campaign officials that WikiLeaks would release information damaging to candidate Clinton. WikiLeaks’s first release came in July 2016. Around the same time, candidate Trump announced that he hoped Russia would recover emails described as missing from a private server used by Clinton when she was Secretary of State (he later said that he was speaking sarcastically). [Redacted: Harm to Ongoing Matter] WikiLeaks began releasing Podesta’s stolen emails on October 7, 2016, less than one hour after a U.S. media outlet released video considered damaging to candidate Trump. Section III of this Report details the Office’s investigation into the Russian hacking operations, as well as other efforts by Trump Campaign supporters to obtain Clinton-related emails. The social media campaign and the GRU hacking operations coincided with a series of contacts between Trump Campaign officials and individuals with ties to the Russian government. The Office investigated whether those contacts reflected or resulted in the Campaign conspiring or coordinating with Russia in its election-interference activities. Although the investigation established that the Russian government perceived it would benefit from a Trump presidency and worked to secure that outcome, and that the Campaign expected it would benefit electorally from information stolen and released through Russian efforts, the investigation did not establish that members of the Trump Campaign conspired or coordinated with the Russian government in its election interference activities. The Russian contacts consisted of business connections, offers of assistance to the Campaign, invitations for candidate Trump and Putin to meet in person, invitations for Campaign officials and representatives of the Russian government to meet, and policy positions seeking improved U.S.-Russian relations. Section IV of this Report details the contacts between Russia and the Trump Campaign during the campaign and transition periods, the most salient of which are summarized below in chronological order. 2015. Some of the earliest contacts were made in connection with a Trump Organization real-estate project in Russia known as Trump Tower Moscow. Candidate Trump signed a Letter of Intent for Trump Tower Moscow by November 2015, and in January 2016 Trump Organization executive Michael Cohen emailed and spoke about the project with the office of Russian government press secretary Dmitry Peskov. The Trump Organization pursued the project through at least June 2016, including by considering travel to Russia by Cohen and candidate Trump. Spring 2016. Campaign foreign policy advisor George Papadopoulos made early contact with Joseph Mifsud, a London-based professor who had connections to Russia and traveled to Moscow in April 2016. Immediately upon his return to London from that trip, Mifsud told Papadopoulos that the Russian government had “dirt” on Hillary Clinton in the form of thousands of emails. One week later, in the first week of May 2016, Papadopoulos suggested to a representative of a foreign government that the Trump Campaign had received indications from the Russian government that it could assist the Campaign through the anonymous release of information damaging to candidate Clinton. Throughout that period of time and for several months thereafter, Papadopoulos worked with Mifsud and two Russian nationals to arrange a meeting between the Campaign and the Russian government. No meeting took place. Summer 2016. Russian outreach to the Trump Campaign continued into the summer of 2016, as candidate Trump was becoming the presumptive Republican nominee for President. On June 9, 2016, for example, a Russian lawyer met with senior Trump Campaign officials Donald Trump Jr., Jared Kushner, and campaign chairman Paul Manafort to deliver what the email proposing the meeting had described as “official documents and information that would incriminate Hillary.” The materials were offered to Trump Jr. as “part of Russia and its government’s support for Mr. Trump.” The written communications setting up the meeting showed that the Campaign anticipated receiving information from Russia that could assist candidate Trump’s electoral prospects, but the Russian lawyer’s presentation did not provide such information. Days after the June 9 meeting, on June 14, 2016, a cybersecurity firm and the DNC announced that Russian government hackers had infiltrated the DNC and obtained access to opposition research on candidate Trump, among other documents. In July 2016, Campaign foreign policy advisor Carter Page traveled in his personal capacity to Moscow and gave the keynote address at the New Economic School. Page had lived and worked in Russia between 2003 and 2007. After returning to the United States, Page became acquainted with at least two Russian intelligence officers, one of whom was later charged in 2015 with conspiracy to act as an unregistered agent of Russia. Page’s July 2016 trip to Moscow and his advocacy for pro-Russian foreign policy drew media attention. The Campaign then distanced itself from Page and, by late September 2016, removed him from the Campaign. July 2016 was also the month WikiLeaks first released emails stolen by the GRU from the DNC. On July 22, 2016, WikiLeaks posted thousands of internal DNC documents revealing information about the Clinton Campaign. Within days, there was public reporting that U.S. intelligence agencies had “high confidence” that the Russian government was behind the theft of emails and documents from the DNC. And within a week of the release, a foreign government informed the FBI about its May 2016 interaction with Papadopoulos and his statement that the Russian government could assist the Trump Campaign. On July 31, 2016, based on the foreign government reporting, the FBI opened an investigation into potential coordination between the Russian government and individuals associated with the Trump Campaign. Separately, on August 2, 2016, Trump campaign chairman Paul Manafort met in New York City with his long-time business associate Konstantin Kilimnik, who the FBI assesses to have ties to Russian intelligence. Kilimnik requested the meeting to deliver in person a peace plan for Ukraine that Manafort acknowledged to the Special Counsel’s Office was a “backdoor” way for Russia to control part of eastern Ukraine; both men believed the plan would require candidate Trump’s assent to succeed (were he to be elected President). They also discussed the status of the Trump Campaign and Manafort’s strategy for winning Democratic votes in Midwestern states. Months before that meeting, Manafort had caused internal polling data to be shared with Kilimnik, and the sharing continued for some period of time after their August meeting. Post-2016 Election. Immediately after the November 8 election, Russian government officials and prominent Russian businessmen began trying to make inroads into the new administration. The most senior levels of the Russian government encouraged these efforts. The Russian Embassy made contact hours after the election to congratulate the President-Elect and to arrange a call with President Putin. Several Russian businessmen picked up the effort from there. Kirill Dmitriev, the chief executive officer of Russia’s sovereign wealth fund, was among the Russians who tried to make contact with the incoming administration. In early December, a business associate steered Dmitriev to Erik Prince, a supporter of the Trump Campaign and an associate of senior Trump advisor Steve Bannon. Dmitriev and Prince later met face-to-face in January 2017 in the Seychelles and discussed U.S.-Russia relations. During the same period, another business associate introduced Dmitriev to a friend of Jared Kushner who had not served on the Campaign or the Transition Team. Dmitriev and Kushner’s friend collaborated on a short written reconciliation plan for the United States and Russia, which Dmitriev implied had been cleared through Putin. The friend gave that proposal to Kushner before the inauguration, and Kushner later gave copies to Bannon and incoming Secretary of State Rex Tillerson. On December 29, 2016, then-President Obama imposed sanctions on Russia for having interfered in the election. Incoming National Security Advisor Michael Flynn called Russian Ambassador Sergey Kislyak and asked Russia not to escalate the situation in response to the sanctions. The following day, Putin announced that Russia would not take retaliatory measures in response to the sanctions at that time. Hours later, President-Elect Trump tweeted, “Great move on delay (by V. Putin).” The next day, on December 3 I, 20 I 6, Kislyak called Flynn and told him the request had been received at the highest levels and Russia had chosen not to retaliate as a result of Flynn’s request. On January 6, 2017, members of the intelligence community briefed President-Elect Trump on a joint assessment—drafted and coordinated among the Central Intelligence Agency, FBI, and National Security Agency—that concluded with high confidence that Russia had intervened in the election through a variety of means to assist Trump’s candidacy and harm Clinton’s. A declassified version of the assessment was publicly released that same day. I have been authorized by the Department of Justice to confirm that the FBI, as part of our counterintelligence mission, is investigating the Russian government’s efforts to interfere in the 2016 presidential election, and that includes investigating the nature of any links between individuals associated with the Trump campaign and the Russian government and whether there was any coordination between the campaign and Russia’s efforts. . . . As with any counterintelligence investigation, this will also include an assessment of whether any crimes were committed. The investigation continued under then-Director Comey for the next seven weeks until May 9, 2017, when President Trump fired Comey as FBI Director—an action which is analyzed in Volume II of the report. On May 17, 2017, Acting Attorney General Rod Rosenstein appointed the Special Counsel and authorized him to conduct the investigation that Comey had confirmed in his congressional testimony, as well as matters arising directly from the investigation, and any other matters within the scope of 28 C.F.R. § 600.4(a), which generally covers efforts to interfere with or obstruct the investigation. President Trump reacted negatively to the Special Counsel’s appointment. He told advisors that it was the end of his presidency, sought to have Attorney General Jefferson (Jeff) Sessions unrecuse from the Russia investigation and to have the Special Counsel removed, and engaged in efforts to curtail the Special Counsel’s investigation and prevent the disclosure of evidence to it, including through public and private contacts with potential witnesses. Those and related actions are described and analyzed in Volume II of the report. In reaching the charging decisions described in Volume I of the report, the Office determined whether the conduct it found amounted to a violation of federal criminal law chargeable under the Principles of Federal Prosecution. See Justice Manual § 9-27.000 et seq. (2018). The standard set forth in the Justice Manual is whether the conduct constitutes a crime; if so, whether admissible evidence would probably be sufficient to obtain and sustain a conviction; and whether prosecution would serve a substantial federal interest that could not be adequately served by prosecution elsewhere or through non-criminal alternatives. See Justice Manual § 9-27.220. Section V of the report provides detailed explanations of the Office’s charging decisions, which contain three main components. Second, while the investigation identified numerous links between individuals with ties to the Russian government and individuals associated with the Trump Campaign, the evidence was not sufficient to support criminal charges. Among other things, the evidence was not sufficient to charge any Campaign official as an unregistered agent of the Russian government or other Russian principal. And our evidence about the June 9, 2016 meeting and WikiLeaks’s releases of hacked materials was not sufficient to charge a criminal campaign-finance violation. Further, the evidence was not sufficient to charge that any member of the Trump Campaign conspired with representatives of the Russian government to interfere in the 2016 election. Third, the investigation established that several individuals affiliated with the Trump Campaign lied to the Office, and to Congress, about their interactions with Russian-affiliated individuals and related matters. Those lies materially impaired the investigation of Russian election interference. The Office charged some of those lies as violations of the federal false statements statute. Former National Security Advisor Michael Flynn pleaded guilty to lying about his interactions with Russian Ambassador Kislyak during the transition period. George Papadopoulos, a foreign policy advisor during the campaign period, pleaded guilty to lying to investigators about, inter alia, the nature and timing of his interactions with Joseph Mifsud, the professor who told Papadopoulos that the Russians had dirt on candidate Clinton in the form of thousands of emails. Former Trump Organization attorney Michael Cohen pleaded guilty to making false statements to Congress about the Trump Moscow project. [Redacted: Harm to Ongoing Matter] And in February 2019, the U.S. District Court for the District of Columbia found that Manafort lied to the Office and the grand jury concerning his interactions and communications with Konstantin Kilimnik about Trump Campaign polling data and a peace plan for Ukraine. The Office investigated several other events that have been publicly reported to involve potential Russia-related contacts. For example, the investigation established that interaction between Russian Ambassador Kislyak and Trump Campaign officials both at the candidate’s April 2016 foreign policy speech in Washington, D.C., and during the week of the Republican National Convention were brief, public, and non-substantive. And the investigation did not establish that one Campaign official’s efforts to dilute a portion of the Republican Party platform on providing assistance to Ukraine were undertaken at the behest of candidate Trump or Russia. The investigation also did not establish that a meeting between Kislyak and Sessions in September 2016 at Sessions’s Senate office included any more than a passing mention of the presidential campaign. The investigation did not always yield admissible information or testimony, or a complete picture of the activities undertaken by subjects of the investigation. Some individuals invoked their Fifth Amendment right against compelled self-incrimination and were not, in the Office’s judgment, appropriate candidates for grants of immunity. The Office limited its pursuit of other witnesses and information—such as information known to attorneys or individuals claiming to be members of the media—in light of internal Department of Justice policies. See, e.g., Justice Manual §§ 9-13.400, 13.410. Some of the information obtained via court process, moreover, was presumptively covered by legal privilege and was screened from investigators by a filter (or “taint”) team. Even when individuals testified or agreed to be interviewed, they sometimes provided information that was false or incomplete, leading to some of the false-statements charges described above. And the Office faced practical limits on its ability to access relevant evidence as well-numerous witnesses and subjects lived abroad, and documents were held outside the United States. Further, the Office learned that some of the individuals we interviewed or whose conduct we investigated—including some associated with the Trump Campaign—deleted relevant communications or communicated during the relevant period using applications that feature encryption or that do not provide for long-term retention of data or communications records. In such cases, the Office was not able to corroborate witness statements through comparison to contemporaneous communications or fully question witnesses about statements that appeared inconsistent with other known facts. Our obstruction-of-justice inquiry focused on a series of actions by the President that related to the Russian-interference investigations, including the President’s conduct towards the law enforcement officials overseeing the investigations and the witnesses to relevant events. The Campaign’s response to reports about Russian support for Trump. During the 2016 presidential campaign, questions arose about the Russian government’s apparent support for candidate Trump. After WikiLeaks released politically damaging Democratic Party emails that were reported to have been hacked by Russia, Trump publicly expressed skepticism that Russia was responsible for the hacks at the same time that he and other Campaign officials privately sought information [Redacted: Harm to Ongoing Matter] about any further planned WikiLeaks releases. Trump also denied having any business in or connections to Russia, even though as late as June 2016 the Trump Organization had been pursuing a licensing deal for a skyscraper to be built in Russia called Trump Tower Moscow. After the election, the President expressed concerns to advisors that reports of Russia’s election interference might lead the public to question the legitimacy of his election. Conduct involving FBI Director Comey and Michael Flynn. In mid-January 2017, incoming National Security Advisor Michael Flynn falsely denied to the Vice President, other administration officials, and FBI agents that he had talked to Russian Ambassador Sergey Kislyak about Russia’s response to U.S. sanctions on Russia for its election interference. On January 27, the day after the President was told that Flynn had lied to the Vice President and had made similar statements to the FBI, the President invited FBI Director Comey to a private dinner at the White House and told Comey that he needed loyalty. On February 14, the day after the President requested Flynn’s resignation, the President told an outside advisor, “Now that we fired Flynn, the Russia thing is over.” The advisor disagreed and said the investigations would continue. Later that afternoon, the President cleared the Oval Office to have a one-on-one meeting with Comey. Referring to the FBI’s investigation of Flynn, the President said, “I hope you can see your way clear to letting this go, to letting Flynn go. He is a good guy. I hope you can let this go.” Shortly after requesting Flynn’s resignation and speaking privately to Comey, the President sought to have Deputy National Security Advisor K.T. McFarland draft an internal letter stating that the President had not directed Flynn to discuss sanctions with Kislyak. McFarland declined because she did not know whether that was true, and a White House Counsel’s Office attorney thought that the request would look like a quid pro quo for an ambassadorship she had been offered. investigations because of his role in the Trump Campaign. In early March, the President told White House Counsel Donald McGahn to stop Sessions from recusing. And after Sessions announced his recusal on March 2, the President expressed anger at the decision and told advisors that he should have an Attorney General who would protect him. That weekend, the President took Sessions aside at an event and urged him to “unrecuse.” Later in March, Comey publicly disclosed at a congressional hearing that the FBI was investigating “the Russian government’s efforts to interfere in the 2016 presidential election,” including any links or coordination between the Russian government and the Trump Campaign. In the following days, the President reached out to the Director of National Intelligence and the leaders of the Central Intelligence Agency (CIA) and the National Security Agency (NSA) to ask them what they could do to publicly dispel the suggestion that the President had any connection to the Russian election-interference effort. The President also twice called Comey directly, notwithstanding guidance from McGahn to avoid direct contacts with the Department of Justice. Comey had previously assured the President that the FBI was not investigating him personally, and the President asked Comey to “lift the cloud” of the Russia investigation by saying that publicly. The appointment of a Special Counsel and efforts to remove him. On May 17, 2017, the Acting Attorney General for the Russia investigation appointed a Special Counsel to conduct the investigation and related matters. The President reacted to news that a Special Counsel had been appointed by telling advisors that it was “the end of his presidency” and demanding that Sessions resign. Sessions submitted his resignation, but the President ultimately did not accept it. The President told aides that the Special Counsel had conflicts of interest and suggested that the Special Counsel therefore could not serve. The President’s advisors told him the asserted conflicts were meritless and had already been considered by the Department of Justice. On June 14, 2017, the media reported that the Special Counsel’s Office was investigating whether the President had obstructed justice. Press reports called this “a major turning point” in the investigation: while Comey had told the President he was not under investigation, following Comey’s firing, the President now was under investigation. The President reacted to this news with a series of tweets criticizing the Department of Justice and the Special Counsel’s investigation. On June 17, 2017, the President called McGahn at home and directed him to call the Acting Attorney General and say that the Special Counsel had conflicts of interest and must be removed. McGahn did not carry out the direction, however, deciding that he would resign rather than trigger what he regarded as a potential Saturday Night Massacre. Efforts to curtail the Special Counsel’s investigation. Two days after directing McGahn to have the Special Counsel removed, the President made another attempt to affect the course of the Russia investigation. On June 19, 2017, the President met one-on-one in the Oval Office with his former campaign manager Corey Lewandowski, a trusted advisor outside the government, and dictated a message for Lewandowski to deliver to Sessions. The message said that Sessions should publicly announce that, notwithstanding his recusal from the Russia investigation, the investigation was “very unfair” to the President, the President had done nothing wrong, and Sessions planned to meet with the Special Counsel and “let [him] move forward with investigating election meddling for future elections.” Lewandowski said he understood what the President wanted Sessions to do. One month later, in another private meeting with Lewandowski on July 19, 2017, the President asked about the status of his message for Sessions to limit the Special Counsel investigation to future election interference. Lewandowski told the President that the message would be delivered soon. Hours after that meeting, the President publicly criticized Sessions in an interview with the New York Times, and then issued a series of tweets making it clear that Sessions’s job was in jeopardy. Lewandowski did not want to deliver the President’s message personally, so he asked senior White House official Rick Dearborn to deliver it to Sessions. Dearborn was uncomfortable with the task and did not follow through. Efforts to prevent public disclosure of evidence. In the summer of 2017, the President learned that media outlets were asking questions about the June 9, 2016 meeting at Trump Tower between senior campaign officials, including Donald Trump Jr., and a Russian lawyer who was said to be offering damaging information about Hillary Clinton as “part of Russia and its government’s support for Mr. Trump.” On several occasions, the President directed aides not to publicly disclose the emails setting up the June 9 meeting, suggesting that the emails would not leak and that the number of lawyers with access to them should be limited. Before the emails became public, the President edited a press statement for Trump Jr. by deleting a line that acknowledged that the meeting was with “an individual who [Trump Jr.] was told might have information helpful to the campaign” and instead said only that the meeting was about adoptions of Russian children. When the press asked questions about the President’s involvement in Trump Jr.’s statement, the President’s personal lawyer repeatedly denied the President had played any role. Further efforts to have the Attorney General take control of the investigation. In early summer 2017, the President called Sessions at home and again asked him to reverse his recusal from the Russia investigation. Sessions did not reverse his recusal. In October 20 17, the President met privately with Sessions in the Oval Office and asked him to “take [a] look” at investigating Clinton. In December 2017, shortly after Flynn pleaded guilty pursuant to a cooperation agreement, the President met with Sessions in the Oval Office and suggested, according to notes taken by a senior advisor, that if Sessions unrecused and took back supervision of the Russia investigation, he would be a “hero.” The President told Sessions, “I’m not going to do anything or direct you to do anything. I just want to be treated fairly.” In response, Sessions volunteered that he had never seen anything “improper” on the campaign and told the President there was a “whole new leadership team” in place. He did not unrecuse. Efforts to have McGahn deny that the President had ordered him to have the Special Counsel removed. In early 2018, the press reported that the President had directed McGahn to have the Special Counsel removed in June 2017 and that McGahn had threatened to resign rather than carry out the order. The President reacted to the news stories by directing White House officials to tell McGahn to dispute the story and create a record stating he had not been ordered to have the Special Counsel removed. McGahn told those officials that the media reports were accurate in stating that the President had directed McGahn to have the Special Counsel removed. The President then met with McGahn in the Oval Office and again pressured him to deny the reports. Tn the same meeting, the President also asked McGahn why he had told the Special Counsel about the President’s effort to remove the Special Counsel and why McGahn took notes of his conversations with the President. McGahn refused to back away from what he remembered happening and perceived the President to be testing his mettle. cases. First, the investigation concerned the President, and some of his actions, such as firing the FBI director, involved facially lawful acts within his Article II authority, which raises constitutional issues discussed below. At the same time, the President’s position as the head of the Executive Branch provided him with unique and powerful means of influencing official proceedings, subordinate officers, and potential witnesses—all of which is relevant to a potential obstruction-of-justice analysis. Second, unlike cases in which a subject engages in obstruction of justice to cover up a crime, the evidence we obtained did not establish that the President was involved in an underlying crime related to Russian election interference. Although the obstruction statutes do not require proof of such a crime, the absence of that evidence affects the analysis of the President’s intent and requires consideration of other possible motives for his conduct. Third, many of the President’s acts directed at witnesses, including discouragement of cooperation with the government and suggestions of possible future pardons, took place in public view. That circumstance is unusual, but no principle of law excludes public acts from the reach of the obstruction laws. If the likely effect of public acts is to influence witnesses or alter their testimony, the harm to the justice system’s integrity is the same. The President’s counsel raised statutory and constitutional defenses to a possible obstruction-of-justice analysis of the conduct we investigated. We concluded that none of those legal defenses provided a basis for declining to investigate the facts. in Section 1512(b) aimed specifically at conduct intended to prevent or hinder the communication to law enforcement of information related to a federal crime. Constitutional defenses. As for constitutional defenses arising from the President’s status as the head of the Executive Branch, we recognized that the Department of Justice and the courts have not definitively resolved these issues. We therefore examined those issues through the framework established by Supreme Court precedent governing separation-of-powers issues. The Department of Justice and the President’s personal counsel have recognized that the President is subject to statutes that prohibit obstruction of justice by bribing a witness or suborning perjury because that conduct does not implicate his constitutional authority. With respect to whether the President can be found to have obstructed justice by exercising his powers under Article II of the Constitution, we concluded that Congress has authority to prohibit a President’s corrupt use of his authority in order to protect the integrity of the administration of justice. ability to exercise Article Il powers. For example, the proper supervision of criminal law does not demand freedom for the President to act with a corrupt intention of shielding himself from criminal punishment, avoiding financial liability, or preventing personal embarrassment. To the contrary, a statute that prohibits official action undertaken for such corrupt purposes furthers, rather than hinders, the impartial and evenhanded administration of the law. Tt also aligns with the President’s constitutional duty to faithfully execute the laws. Finally, we concluded that in the rare case in which a criminal investigation of the President’s conduct is justified, inquiries to determine whether the President acted for a corrupt motive should not impermissibly chill his performance of his constitutionally assigned duties. The conclusion that Congress may apply the obstruction laws to the President’s corrupt exercise of the powers of office accords with our constitutional system of checks and balances and the principle that no person is above the law. This is a bad document for Trump and terrible for Barr who clearly was running interference for Trump. Mueller team considered Trump’s written answers ‘inadequate,’ but decided against subpoena fight for interview. Trump directed White House Counsel Don McGahn in June 2017 to call the acting attorney general and say that Mueller must be ousted because he had conflicts of interest. Mueller declined to make a call on obstruction based in part on the unsettled Q of whether POTUS can obstruct justice. He then makes the case that POTUS *can* obstruct, knocking down the legal argument made by Barr in his 2018 memo..this is the “legal theory” Barr disagreed with. Peter Smith is the guy who committed suicide. Trump, who has “one of the great memories of all time,” can’t recall under oath a lot of things about the Russia investigation. 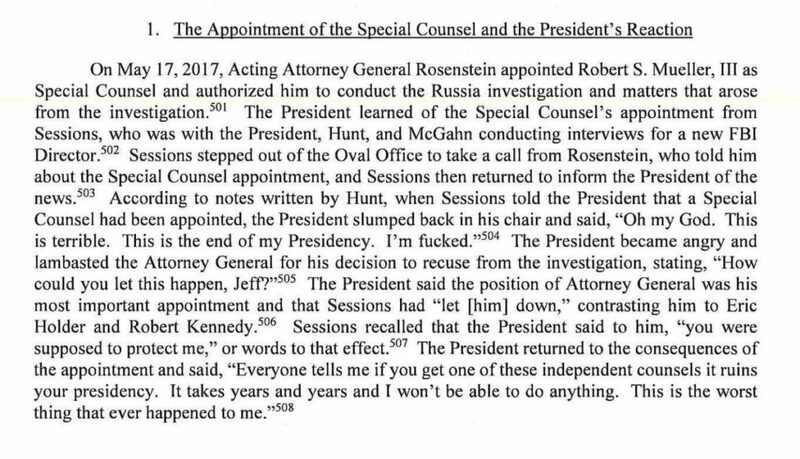 Mueller report says Trump instructed Rosenstein to put something clearing him on Russia in memo he was drafting to justify firing of Comey. So they all knew that was the motive. Here’s Pap’s effort to set up an off the record September meeting with Russia. Mueller explicitly says as a matter of DOJ rules, “no charges can be brought” against POTUS. No charges possible means no charges possible, not by Mueller or by Barr. So the Mueller report lists cases related to Manafort and one entirely redacted one as transferred to other offices, and 12 referrals redacted as “ongoing matters.” So 14 things still out there. Mueller reaches the conclusion that “we were not persuaded by the argument that the President has blanket constitutional immunity to engage in acts that would corruptly obstruct justice” but doesn’t seek indictment. The investigation also identified numerous links between the Russian government and the Trump campaign. Although the investigation established that the Russian government perceived it would benefit from a Trump presidency and worked to secure that outcome and that the Campaign expected it would benefit electorally from information stolen and released through the Russian efforts,the investigation did not establish that members of the Trump Campaign conspired or coordinate with the Russian government in its election interference activities. Barr omitting the “although” part of that sentence he quoted on collusion tells you everything you need to know. A really striking contradiction in Mueller report from what Barr said this morning – Barr said Mueller told him that the OLC opinion on not indicting a sitting president wasn’t a factor. The report includes it as a factor. It’s really pathetic that Bill Barr stood up in public and said Trump had cooperated with the investigation when he gave utterly contemptuous responses to Mueller’s questions. But I guess he doesn’t care. 1-Trump claimed he never asked for loyalty from Comey – Mueller found he did. 2-Trump claimed he never asked Comey to let Flynn matter go – Mueller found he did. I suggest lowering expectations for the Mueller Report. I expect it to show evidence — evidence — of Trump’s obstruction, but since his motivation is an element that must be proven for an obstruction conviction, and since his motivation rests only in his head (or can at best be inferred, but not proved beyond a reasonable doubt), the report will likely conclude that an obstruction charge would be hard to prosecute. We already knew that. Politically, of course, it will be damaging, but again, no new revelations. At the end, it will be fodder for impeachment talks, but in the end, nothing will come of it. Did Mueller consider Trump’s enthusiastic encouragement of Russia’s operation and his move to offer Russia sanctions relief from a prosecutorial standpoint (that is, a quid pro quo trading the Trump Tower deal and election assistance for sanctions relief)? If so, what were the considerations about potential criminality of it, including considerations of presidential power? If not, was any part of this referred? Was Mueller able to determine why Manafort shared polling data with Konstantin Kilimnik on August 2, 2016? Did he know it would be shared with Russians close to the election interference operation? Did he agree to a quid pro quo involving the Ukrainian peace deal as sanctions relief he pursued for another 20 months? Did Manafort’s lies prevent Mueller from answering these questions? What was the nature of and what was ultimately done with that polling data? Why didn’t Mueller charge this as conspiracy or coordination? Did it have to do with Manafort’s lies and Gates’ limited credibility? What consideration did prosecutors give to charging this as an instance of conspiracy or coordination? What consideration did prosecutors give to charging the public claims about this meeting as an instance of false statements? Did Trump know about this meeting and if so did that change the calculus (because of presidential equities) on a quid pro quo? Did Mueller decide Don Jr is simply too stupid to enter into a conspiracy? Did Mueller decide the graft he uncovered was not criminal, not prosecutable, or did he refer it? It is 9:30 a.m. now and Congress is expected to get the report at 11:00. News reports are saying that the White House has seen the report, or at least discussed it with DOJ officials. AG Barr is about to give a press conference. This came as a late night surprise to reporters. He is expected to talk about the process of redaction. The Trump WH staff hope to make Mueller Report news a “slow burn” that will blow over by “next week,” (after the Holiday weekend). And they may well succeed. Certainly the rollout is being down to Trump’s benefit. He says President Trump’s personal lawyer was allowed to read Mueller’s redacted report before release. So basically Barr Letter, extended dance mix. Please note this: Barr is confirming an extensive Russian effort to sabotage our democracy that Trump himself largely still refuses to acknowledge happened at all, for corrupt purposes. But he is doing HUGE pre-spinning. Barr argues Trump didn’t do anything to prevent Robert Mueller from finishing his investigation, and contends that his actions can be explained by sincere frustration and anger that the probe was undermining his presidency. THAT’S NOT A DEFENSE! Barr telling us all the ways the Mueller report exonerates Trump with nobody actually having seen it yet feels like the biggest act of confirmation bias in American history. Barr flatly asserts that Trump's situation was NOT of his own making: "President Trump faced an unprecedented situation, as he entered into office and sought to perform his responsibilities as president, federal agents and prosecutors were scrutinizing his conduct…"
Barr’s repeated use of the term “no collusion” only shows he is in the pocket of Trump. Chris Wallace on Fox: "The Attorney General seemed almost to be acting as the counselor for the defense, the counselor for the president, rather than the Attorney General, talking about his motives, his emotions… Really, as I say, making a case for the president." To prosecute for obstruction of justice, intent must be proven. Although the word “intent” is often used synonymously with “motivation”, they are not the same thing. “Motivation” alludes to the ulterior cause, that induces a person to do a particular act. “Intent” refers to a purposeful action and a conscious decision to perform an act, that is forbidden by law. Take a shoplifting case where Jane Doe walks off with mascara in her purse without paying for it. Her motivation may be obvious: she wanted the mascara. But wanting the mascara is not illegal. It’s her intent that matters. She could have wanted the mascara, but absent-mindedly put it in her purse, INTENDING to pay for it at the counter. That would make her innocent of shoplifting. On the other hand, if she put it in her purse INTENDING to hide it so she could leave without paying, that is a criminal intent. Barr seems to be saying that Trump’s motivation (to end an investigation that was dogging him) is a defense. I am happy to agree Trump’s MOTIVATION may have been “legal” or reasonable, just as it is legal and reasonable to “want mascara”. 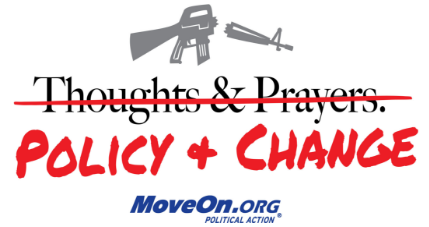 But it is the INTENT that matters. And Trump’s firing of Comey was, it seems, INTENDED to cut off an investigation. (The fact that it failed to do so is also irrelevant). Barr actually seems to agree (without saying so) that the intent was to end the investigation, which leads me to suspect that Mueller concluded the same thing. f an investigation. (The fact that it failed to do so is also irrelevant). Some of the more than dozen current and former White House officials who cooperated with special counsel Robert Mueller are worried that the version of his report expected to be made public on Thursday will expose them as the source of damaging information about President Donald Trump, according to multiple witnesses in the investigation. Some of the officials and their lawyers have sought clarity from the Justice Department on whether the names of those who cooperated with Mueller’s team will be redacted or if the public report will be written in a way that makes it obvious who shared certain details of Trump’s actions that were part of the obstruction of justice probe, people familiar with the discussions said. But, they said, the Justice Department has refused to elaborate. Of particular concern is how Trump — and his allies — will react if it appears to be clear precisely who shared information with Mueller, these people said. “They got asked questions and told the truth, and now they’re worried the wrath will follow,” one former White House official said. I’m not sympathetic. These people chose to work for this madman. That should come with a cost. The idea of presidential advisers cowering to a President — any president, but especially an unhinged one — should be of concern to every American who is interested in efficient government as well as government transparency. More than that, it sends a message to every future White House worker — you work for the people; not for the president. You should expect to be held accountable to the people; not the president. 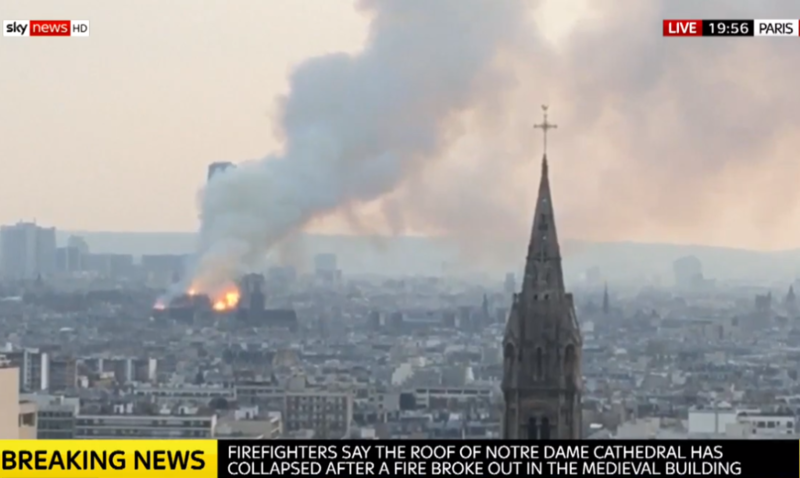 There are few events that can so transfix the world that it seems everyone is watching, but as flames poured out of the Notre Dame de Paris cathedral, the world definitely seemed to be holding its collective breath. 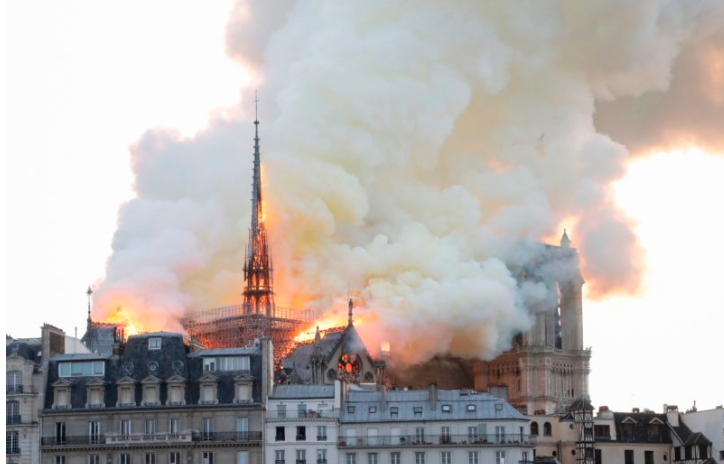 Fortunately, with a human chain of people reaching into the smoky interior as flames crackled above, many of the cathedral’s art treasures and relics were saved. The bells, and the bell towers, did not fall. 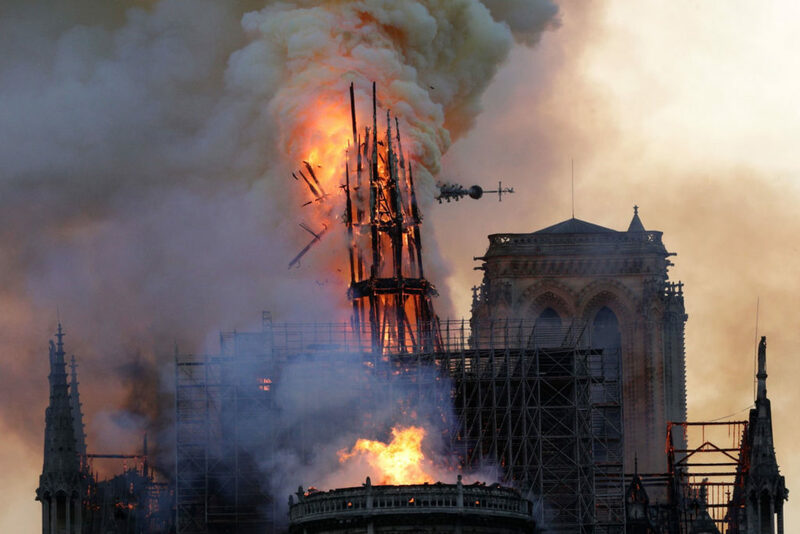 And though the span of fire across the whole of the roof, and the heart-breaking fall of the iconic spire, made it seem impossible at times that anything might survive, at the end of the night all but one end of the massive 850-year-old stone vault remained intact. Images from inside the building show a structure that, for all the damage, seems remarkably whole. 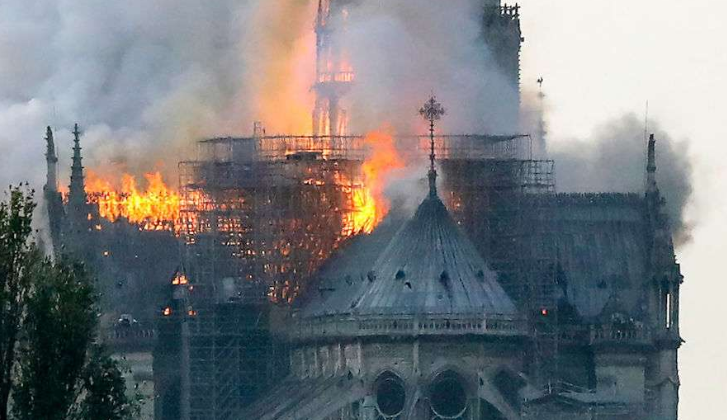 Firefighters also said they managed to save many priceless works of art and some of the church’s most cherished relics, including the crown of thorns that Jesus is said to have worn. French President Macron promised the cathedral will rise again. 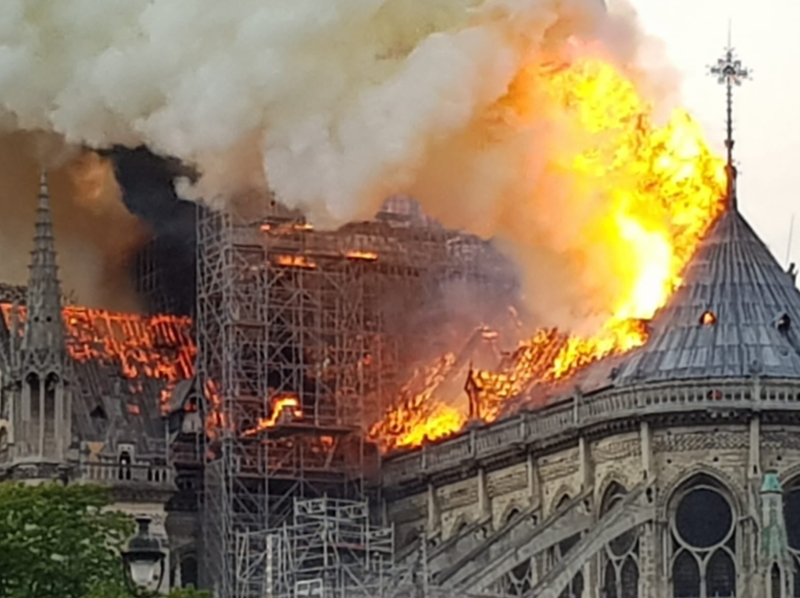 Lost almost completely were Notre Dame’s lead-lined roof and a support structure composed of 800-year-old oak beams. When that roof collapsed almost along its full length on Monday afternoon, images showed the entire structure shrouded in flames, and it seemed impossible that anything would persist. 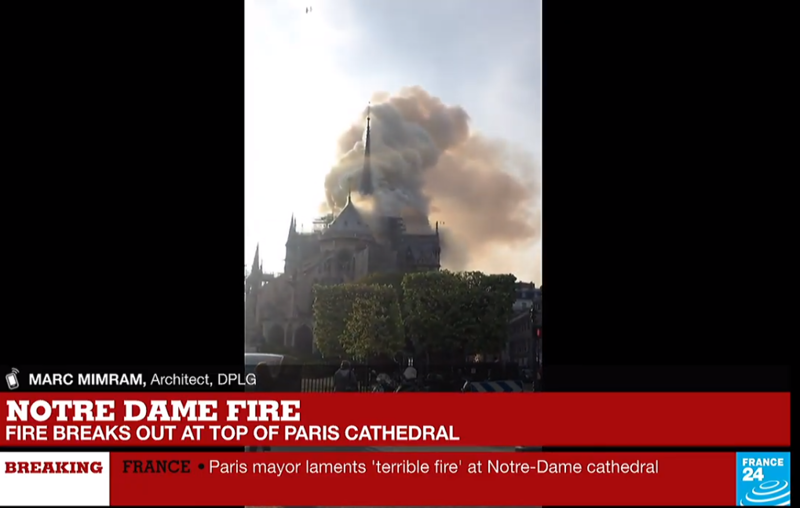 But firefighters brought the flames under control, and the stone vaults appear to have sheltered the building’s interior—a feature that was actually designed into Notre Dame from the beginning. Other than a collapse that occurred at one end, it is unclear at this point how much damage was suffered by the stone vault. Intense heating of the stone just below the roof may still lead to additional failures, or require some very careful removal of weakened material, but it appears that the massive columns and buttresses that support the 12th-century structure are intact. The New York Times reports that the family of Bernard Arnault, who owns the luxury brands Hennessy and Louis Vuitton, plans to contribute €200 million toward rebuilding Notre Dame. The family of François-Henri Pinault, owner of Gucci and Yves Saint Laurent and husband of actor Salma Hayek, has pledged €100 million. A public fundraising drive is being organized to bring in still more. the cathedral’s main bell (named Emanuelle, which lives in the South tower). Reports are mixed or unknown regarding the “True Cross” (wood purported to be part of Jesus’s crucifixion cross” and one of the Holy Nails. There were also numerous sculptures, statues and paintings inside the cathedral depicting Biblical scenes and saints whose fate remains unknown at this time. 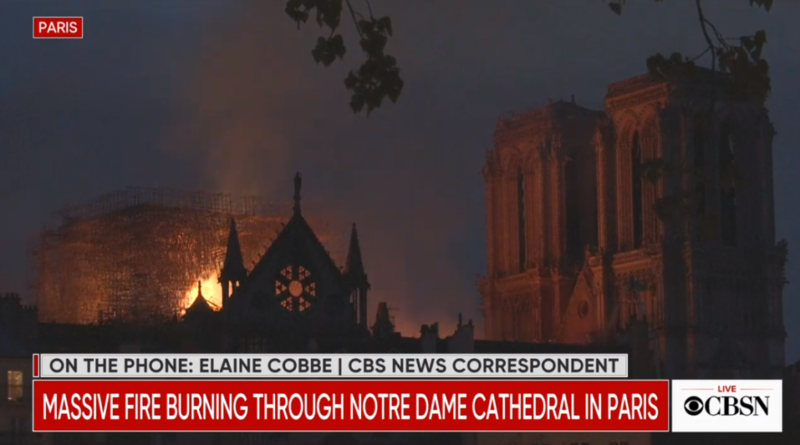 A hero priest made a daring dash into the burning Notre Dame cathedral Monday night to save the Crown of Thorns, a religious relic dating back to the 13th century, according to reports. 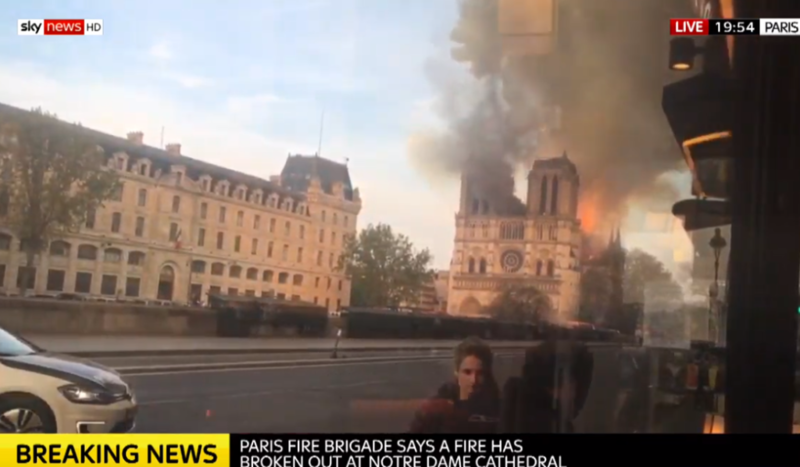 Jean-Marc Fournier, the chaplain of the Paris Fire Brigade, also rescued the Blessed Sacrament, the devotional name for the body and blood of Jesus Christ in the form of consecrated bread and wine, Ireland’s radio station NewsTalk reported. 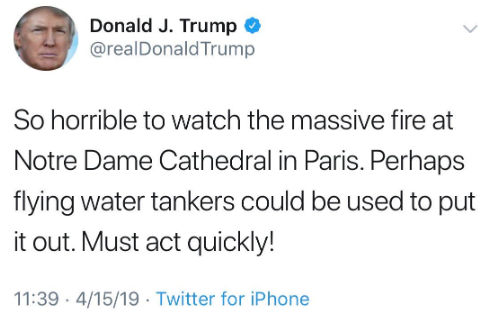 Fournier was among the responders who formed a human chain to save some of the most precious artifacts stored at Notre Dame. The Crown of Thorns, said to be placed on the head of Jesus Christ at crucifixion, was brought to Paris by French King Louis IX in 1238. The ornate headpiece — which is rarely displayed to the public — was stored in a gold case in the cathedral’s treasury. Trump attorneys William S. Consovoy and Stefan Passantino are urging Mazars USA not to comply with a subpoena that Oversight Chairman Elijah Cummings (D-Md.) issued on Monday for Trump’s financial documents, calling it a politically motivated scheme to take down the president. “It is no secret that the Democrat Party has decided to use its new House majority to launch a flood of investigations into the president’s personal affairs in hopes of using anything they can find to damage him politically,” Consovoy and Passantino wrote to Jerry D. Bernstein, Mazars’ outside counsel, before the subpoena was officially served. “The House Oversight Committee is not a miniature Department of Justice, charged with investigating and prosecuting potential federal crimes. It is a legislative body, not ‘a law enforcement or trial agency,’ and the chairman’s attempt to assume for Congress the role of police, prosecutor, and judge is unconstitutional,” they wrote. Bernstein, Mazars’ outside counsel, did not respond to a request for comment on the Trump attorneys’ letter. In a separate letter to Cummings, Consovoy and Passantino echoed Republicans’ criticism of the Mazars subpoena. I didn’t think it was possible but this is an even weaker formulation of the legal argument than the theory advanced in the first letter. Hard to come up with an explanation other than that there is something in those returns they are really desperate to hide from Congress. Meanwhile, the House Financial Services and Intelligence Committees have subpoenaed Deutsche Bank, which has long provided loans to President Donald Trump despite “a long history of defaults and bankruptcies,” according to the New York Times. During the course of his business career, Trump has reportedly received more than $2 billion in loans from Deutsche Bank. As the president took office, he had more than $300 million in outstanding loans from the financial institution, which was his largest creditor. And since Deutsche Bank does not work for Trump, he can’t stop it. Just happening. Cause unknown, but it may be related to renovations. No deaths reported. 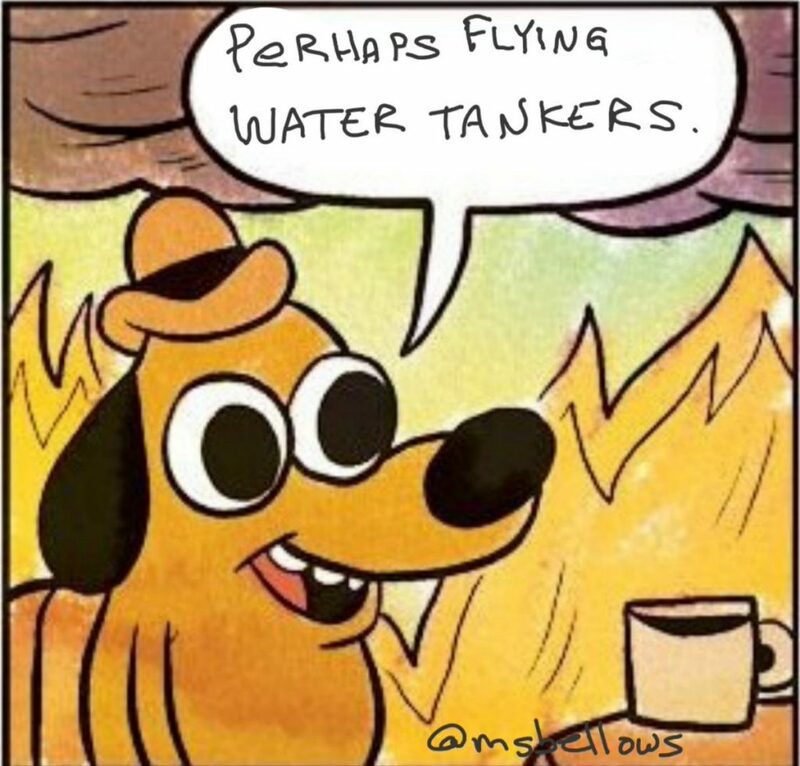 No reports of injuries either. – The North rose window (1250). Notre Dame contained what is purported to be (1) Jesus’ crown of thorns (2) nail used in crucifixion; (3) part of Jesus’ cross. Not to mention invaluable artwork, tapestry, and other artifacts. And as night falls in Paris, they are singing psalms in the street. 5. Does Mueller’s report use any language suggesting that a reasonable prosecutor acting in her discretion could have charged Trump with obstruction but for Department of Justice policy against indicting a sitting president? We know Mueller refused to make the call on whether Trump obstructed justice, but we do not know why he made that decision and whether it had to do with the strength of the evidence. All we know is that Mueller’s report says, “while this report does not conclude that the President committed a crime, it also does not exonerate him” and Barr took the subsequent step of exonerating his boss. 6. Does Mueller point to new specific evidence Congress might consider in pursuing possible impeachment charges against Trump based upon obstruction? If Mueller left the issue for Congress, does he do so laying out clear not previously public evidence for possible impeachment, or is there not much more than a judgment call about whether Trump’s publicly known actions rise to the level of impeachable offenses? 7. To what extent does it look like Barr is trying to protect Trump and Trump’s family, such as Donald Trump Jr.? Despite his expected redactions, has Barr made it possible to evaluate Mueller’s reasoning or the evidence collected? Already Barr has given Trump a great gift by releasing a summary that has allowed Trump to claim his “exoneration” for weeks without anyone being able to raise a counterargument based on the actual evidence collected and analyzed by Mueller. 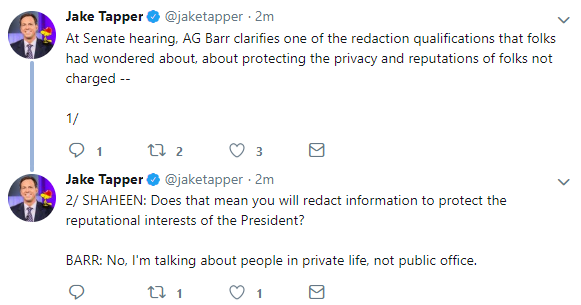 We all are waiting to see if the redaction leaves a credible report, or more reason to be suspicious of Barr and a longer list of questions. We should at least know the answer to this question in a matter of days. UPDATE: Reports are saying that the redacted Mueller Report will be available to the public on Thursday morning. On Wednesday, a man wearing a Trump t-shirt yelled disparaging words at members of a Muslim community gathering at one of the mosques targeted in the Christchurch terror attack in New Zealand. Legal experts noted the charges indicate cases farmed out from the Mueller probe could continue to yield new evidence and even more charges for months or even years. In February 2017, Barry told the court that she would stop hearing cases, without specifying the reason why. By retiring, she ends the court inquiry into her role in the tax scheme. This is your reminder that the President of the United States “loves Wikileaks”. So, what happens next? The folks who reserve their harshest condemnations of the U.S. government for Democratic administrations — a crowd that when combined with Assange groupies forms a perfect circle in a Venn diagram — may get an object lesson in the difference between Democratic and Republican Party governance. Assange, who is only 47, did not go willingly. And he looked like he was 70. There is a fine line between being a whistleblower and a security threat. Assange, in my view, is a little of both, depending on the issue. But you can’t be a security threat, period. We’re living in a dark period in which rights created to protect citizens from abuses of government power are routinely turned inside out and weaponized to help those in power attack their critics and enemies; brazen coverups are repackaged as privacy rights and fidelity to the law. It probably goes without saying that Assange is set to be charged with publishing US national security secrets the theft of which may have been wrong or misguided in some people’s eyes but almost certainly weren’t part of any conspiracy against the United States. Participating in an actual conspiracy on the part of a foreign party which played some role in installing the current President in power won’t be part of the story. As a person, Assange is a loathsome, destructive, megalomaniacal figure. These tendencies, apparent from the start, have undoubtedly been accentuated by years in self-imposed captivity which started and for many years was an effort to escape a legitimate sexual assault investigation. His leaks also exposed other acts of civilian deaths, and friendly fire deaths — all of which would have gone unnoticed to the public. That is a significant issue regardless of one's view of Assange as a person, or his work, or his politics. The Justice Department was clever in drawing up its single-count indictment against Assange. It charges him with “conspiring to commit computer intrusion,” a crime carrying a punishment of up to five years in prison. This goes well beyond the constitutionally protected practices of journalism. Manning, then a U.S. Army intelligence analyst on a military base in Iraq, did not have high-enough clearance to decode the password. Had Assange not encouraged Manning to send him the file containing the password, he wouldn’t have opened himself up to the count in this indictment. And as is Barr's specialty, he's couching outrageous insinuations in superficially reasonable language. He says that it's possible that the surveillance was "adequately predicated." But by calling it "spying," he's leaving the clear impression that it wasn't.
.@SenJackReed: Do you have any evidence there was anything improper in the FBI's counterintelligence investigation of Trump? REED: So what are you investigating? REED: Do you believe it was a 'witch hunt'? The investigation was predicated on what Papadapolous said to an Australian ambassador. The first FISA warrant, against Carter Page, was taken out AFTER Page left the campaign. Now, the FBI may have looked into contacts that the Trump campaign had with foreign bad people, but you kinda have to expect that if you’re dealing with foreign bad people. If that’s all we’re talking about, investigate away. But it is odd that Barr is refusing to state the basis for his suspicions of DOJ wrongdoing. "I don't understand why the campaign was not advised," Barr tells Sen. Graham. He said he wants to make sure there was no abuse of law enforcement or intelligence powers. Leaving aside the fact FBI did brief both campaigns on the threat of Russian interference, Barr should be troubled that the campaign never picked up the phone & told the FBI about any, let alone all, of the outreach it had from Russians. A.G. Barr says that he does not know whether Mueller supports his conclusion on obstruction. Well, let’s get Mueller in and ask him! SEN @ChrisVanHollen: You concluded Trump didn't obstruct justice. Do you agree with Mueller that the 'evidence presents difficult issues of law and fact'? VAN HOLLEN: But *you* exonerated Trump, not Mueller! Well, that’s good at least. SEN. FEINSTEIN, asking AG Barr about the DOJ's decision to support striking down Obamacare: "I assume you wouldn't have taken this position unless the president directed it." 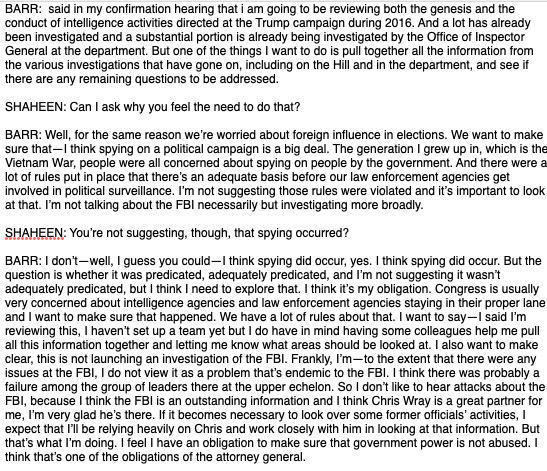 BARR: "That would be a safe assumption." Federal investigators have uncovered more evidence of President Donald Trump‘s involvement in illegal 2016 hush money payments than previously known, according to a new report. Wall Street Journal reports prosecutors have spoken to former Trump communications director Hope Hicks and former Trump security chief Keith Schiller about their contacts with David Pecker. These interviews gravitated around the fact that Pecker has admitted to using his position as chairman of American Media (AMI) and publisher of the National Enquirer to “catch and kill” the story of Trump’s alleged affair with Karen McDougal. Investigators learned that Schiller has spoken to Pecker over the phone, so they are trying to figure out whether Schiller ever put Trump on the line and whether Hicks ever coordinated with Pecker. Ms. Hicks called Mr. Pecker in November 2016 as she was crafting a response to an inquiry from the Journal. Mr. Pecker told her American Media was issuing a statement saying it had paid Ms. McDougal to contribute articles. Interviews and court documents show that prosecutors have gathered information about Trump’s supposed involvement in the payments Michael Cohen made on Trump’s behalf to suppress his alleged affairs with McDougal and Stormy Daniels. WSJ also reports that investigators have a recorded phone conversation between Cohen and a lawyer who represented the two women. 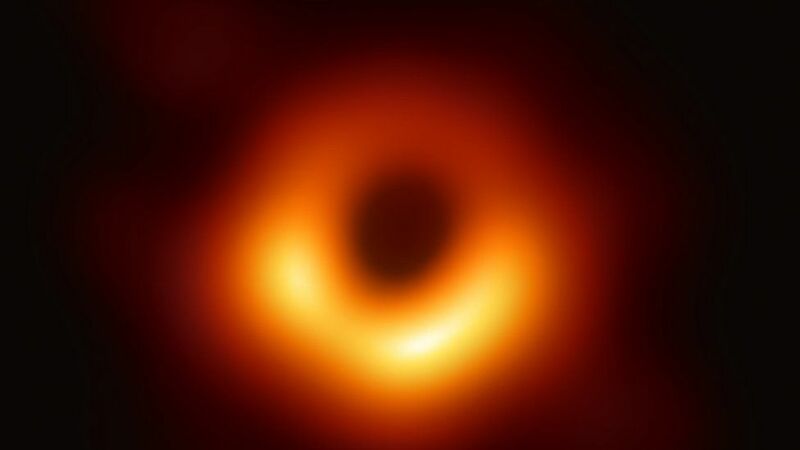 The black hole is 500 million trillion km away and was photographed by a network of eight telescopes across the world. No single telescope is powerful enough to image the black hole. So, in the biggest experiment of its kind, Prof Sheperd Doeleman of the Harvard-Smithsonian Centre for Astrophysics, is director of a project that set up a network of eight linked telescopes. Together, they form the Event Horizon Telescope and can be thought of as a planet-sized array of dishes. A black hole is a region of space from which nothing, not even light, can escape its gravity. Despite the name, they are not empty but instead consist of a huge amount of matter packed densely into a small area. There is a region of space beyond the black hole called the event horizon. This is a “point of no return”, beyond which it is impossible to escape the gravitational effects of the black hole. [ Former FBI general counsel James] Baker: To the best of my recollection [former FBI Deputy Director Andrew McCabe] told me that the deputy attorney general said that he had at least two members of the Cabinet who were ready to invoke the 25th Amendment. Q: And what happened after that during that conversation? Did Mr. McCabe tell you anything else? Baker: I am sure he told me other things in that conversation, but it was in part both of those things were relayed to me with other information with respect to — what the DAG was going through at the time and how he was thinking about his involvement in the firing of Director Comey and how he was thinking about proceeding after that. Q: Did people tell you that the DAG was upset? Q: Did they tell you that he was making jokes? A: This was not a joking sort of time. This was pretty dark. Stephen Miller, the senior advisor to President Donald Trump, would have a sneaky way to ruin the day of Secretary of Homeland Security Kirstjen Nielsen and get her to stop resisting new immigration policy proposals. Quartz reports “former agency officials,” said Miller would leak the monthly number of immigrants apprehended at the border and those seeking asylum to the Washington Examiner, who would then publish a story about the high numbers.